Following collaborations with Hardwell (‘Dynamo’) and Dimitri Vegas & Like Mike (‘More’), Laidback Luke is back with his latest single. This time he is teaming up with Frenchman Martin Solveig, fresh from the release of his latest hit single ‘Hey Now’, for their collaboration ‘BLOW’, which will be released on Luke’s own Mixmash Records imprint soon. After Martin Solveig first premiered the track at Tomorrowland last month, it was recently announced as a new Mixmash single. 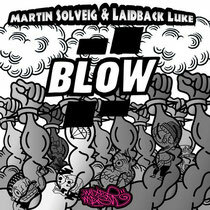 With vocals from the mystery ‘Ludi’ and Martin Solveig himself, ‘BLOW’ combines the very best of the pair’s studio prowess with an undercurrent trademark energy that epitomises the two individuals’ sounds. The track was actually conceived by Luke and Martin in Sydney’s Turning Studios in between two Stereosonic shows in 2012, and with a release date still to be confirmed, check Laidback Luke & Martin Solveig’s official Facebook pages for the latest info.